Welcome to the start of the 2017-2018 school year! The new year brings with it a new opportunity to try new things to support learning for all students. Here are my top ten “must-try” free tech tools for this year! 10. Flipgrid – The “flip” in “flipgrid” comes from the concept of a flipped classroom. Ignite discussion by creating a “grid” where students make video of their thoughts and ideas on a topic you post. Super Cool Hack: Use this in language classes (foreign language or ASL) to post source material and translations! 9. Seesaw – A digital portfolio system for your students. Students can submit materials as typed documents, photos, drawings, video, or links. New to Seesaw, students can log in with their G Suite for Education account instead of scanning a QR code, and students can submit material from their Google Drive! A great solution for early elementary students who are not ready for a full-blown LMS! 8. Read&Write for Chrome – You have to be using Google Chrome for this one, but the benefits are so good! The free version gives you high-quality text-to-speech within Google Docs and PDFs. Teachers can submit their e-mail address to get a free one-year (renewable) subscription to all of the paid features as well. 7. Edublogs – Your students can write for a global audience. That’s a scary thought to many teachers, but the potential benefits are too vast to ignore. If we want students to reflect on their learning, become effective communicators, and create authentic products, blogging is a great way to reach all students. Built on the popular and powerful WordPress system, Edublogs provides an easy way for a teacher to create a single class blog and invite students to become contributors. The teacher retains ultimate control of what becomes public, and students learn digital citizenship alongside of the content they are creating. 6. Canva – Digital Publishing and Graphic Design calls us to merge our content knowledge with creative expression. But, basic productivity tools still assume an 8½”×11″ (or A4) format, based on the tyranny of printed paper. Canva gives you “Publisher” type templates to start from, but in Infographic or other formats that defy traditional size restrictions. Smash the boundaries! 5. Feedbro – I have rediscovered the value of RSS feeds! Yeah, I follow certain people on Twitter or other social media platforms, and I learn a lot from them. But, I can still miss important posts from certain people or organizations, and I don’t want to have to remember to visit their pages every day/week/month to see if there are any updates. Feedbro lets me enter the RSS feed address for my favorite feeds and keep track of updates in one convenient location. Versions available for Chrome or Firefox. 4. Iorad – Creating step-by-step tutorials and screencasts can be a great way to familiarize people with a long series of steps to perform online tasks. Trouble is, these tutorials and screencasts can be very time-consuming to create. Enter Iorad. Start Iorad, and perform your task. Iorad keeps track of where you click and what you type, and produces both a step-by-step tutorial with screenshots, and a screencast of the procedure you just performed. Turn hours of tutorial production into minutes! 3. Recap – Recap takes multimedia student interactivity to another level by shifting the focus away from the teacher’s questions and to the student’s questions. Queues, Journeys, and Video Responses offer exceptional flexibility in using this tool to provide asynchronous communication opportunities, and promote deeper thinking by students who interact with the system. 2. Book Creator – Book Creator has long been one of my favorite tools for the iPad and Android tablets. Giving students the ability to create their own multimedia e-books can ignite a passion for learning, to become “published authors” with expertise in their chosen content area. Now, this capability has been extended to the Chrome browser with the release of the newest version of Book Creator! Anything from short, simple picture books, to comprehensive advanced math and science texts (with built-in video examples!) can be produced with Book Creator. And, if you need a powerful ePub reader to view your completed eBooks, try Readium! 1. iCivics – Anyone else out there seeing a renewed interest in civics education and how government works? Just me? Okay, then…. The mission of iCivics.org is to provide students (and anyone else, really) with immersive simulations into how government works, across all branches, at all levels from local to federal. With Constitution Day coming up on September 17, iCivics is releasing a brand new version of its most popular game, “Do I Have a Right?” Infinitely playable and replayable, the simulations at iCivics are great for introducing students to the complex and complicated world of representative democracy! Which of these have you tried? Any others that you love for 2017-2018? In his excellent TEDx talk, “Math Class Needs a Makeover”, Dan Meyer affirms some basic truths about math class: 1) anyone can learn to be successful in math, 2) traditional approaches to math instruction have poorly served a large number of our students, and 3) making math instruction practical is the key to making it “stick”. He never uses the term “UDL” in his talk, but the changes he proposes are all about changing how we represent material, how we express our conclusions, and how we engage with the curriculum – the three principles of Universal Design for Learning. Here are my ten eleven twelve favorite sites to use to support math instruction. None of them are procedural guides or electronic worksheets. They all involve building an environment that the student can manipulate and get immediate feedback on their efforts. Some of them can be done quickly. Some take longer. But, they all make effective use of the “problem-based learning” model. A vast array of math manipulatives, indexed by grade band and by sub-topic (Number & Operations, Algebra, Geometry, Measurement, and Data Analysis & Probability). This is a long-time favorite of mine. Most of the applications are built on the Java platform, which unfortunately means they will not work on a Chromebook. If you have a teacher station with a browser that still runs Java, some of the manipulatives work extremely well with an interactive whiteboard. CAST provides two iOS apps that keep the goal of developing logic and reasoning skill at the focus, beyond simply providing a right answer. Interactivate includes the standard fare of manipulative activities and stock lessons, but goes the extra step of providing ideas and material for Class Discussions. Also has an associated iOS app. The National Council on Teaching Mathematics provides this set of manipulatives, titled “Illuminations”. Searchable by grade band and sub-topic. Includes Common Core and NCTM standards. Colorado University provides this set of modern HTML5-based manipulatives. Math is the basis for some, and is a strong undercurrent for many of the science activities. Because of the modern platform, these work well on just about any device or screen size. Includes printable support materials for class and teachers. And, it gives you a chance to explain to the class why the word “maths” shows up all over the place! Don’t get thrown off by the UK terminology, the activities are indexed for US grade levels as well. Without using the words “equation” or “algebra”, this interactive puzzle game provides a great introduction to those concepts, while reinforcing number sense and application of basic operations. Math abounds in a set of physics and engineering problems based on the real-life advances designed by Isambard Kingdom Brunel. As you progress through the early tasks, more types of challenges are unlocked. Build, Test, Tweak, Repeat. Somewhat limited set of resources, but the ones that are available are very useful. Geared more for upper elementary. Should work well with modern browsers. A graphing calculator for your browser! Powerful save, overlay, and editing tools. Online graphing calculator, and a host of additional tools for math instruction, including geometry, algebra, calculus, statistics, and more. Downloadable materials as well as online activities. Some movies rely heavily on some aspect of technology (and its development, and the ramifications when things go awry) to advance their plot. These are my ten favorite tech films of all time! 9) WALL-E (2008) – Yes, I have kids. Yes, I watch Disney movies. Occasionally, I even watch one when the kids aren’t around (Mary Poppins is still one of my all-time favorites). This one took a movie plot that is generally only reserved for trying to unsettle adult audiences, and made it accessible and fun for all ages. It still provokes the question of “what would happen if all the people were gone”, but without the cataclysmic darkness that puts most films like this into the “after the kids go to bed” time slot. 8) Apollo 13 (1995) – When the original mission (landing on the moon) of the Apollo 13 crew has to be scrubbed, a new mission takes its place (saving the astronauts’ lives as they return to Earth). 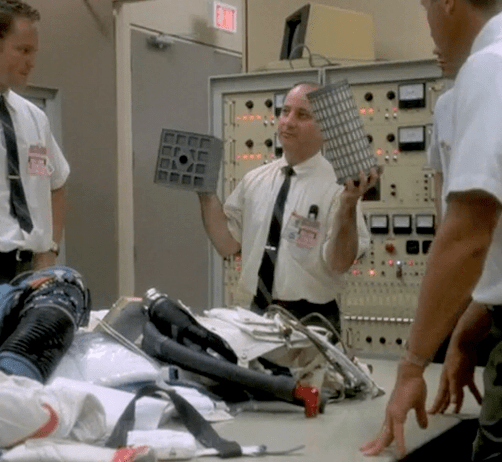 Can you design something to rescue three imperiled astronauts using things like the flight plan cover, duct tape, and socks, before the CO2 levels in the capsule overtake them? How did it actually work? 7) The Terminator (1984) – C’mon. It’s The Terminator. Do you really need to know any more? 6) Ferris Bueller’s Day Off (1986) – Why did this make my list? 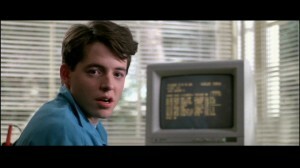 The whole thing couldn’t have been possible without Ferris using a room full of outrageously geeky (for its time) technology to hack the house intercom system, provide medical sound effects, and even hack into the school computer system to eliminate an overabundance of absences. All that, and he couldn’t figure out how to make the odometer go backwards on a 1961 Ferrari 250 GT California Spyder? 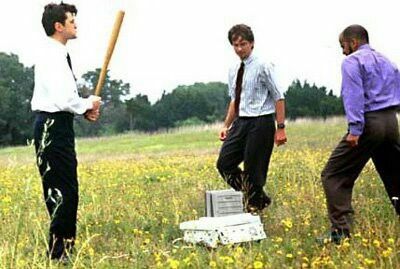 5) Office Space (1999) – The premise of the central plot element in this movie makes you think, “Well, yeah, what DOES happen to the fraction of a cent that gets dropped off of all those financial transactions?” The rest of the movie is built on the positive and negative interactions between the personalities of the characters, but the thoroughly believable idea of siphoning minuscule amounts of money to create a multi-million dollar bank account, and sticking it to the man, practically dares us not to identify with the cubicle dwellers getting screwed at every turn. And who hasn’t wanted to hand out a little street justice by curb-stomping a laser printer that spouted “PC LOAD LETTER” just once too often? Admit it, you want a pair of these gloves. enough into the future that I can imagine myself being still alive should the world turn into something like this. A blend of humans with special abilities (“Precogs”) and technology has allowed law enforcement to detect when someone is going to commit a crime. Using this technology, they preempt the crimes from occurring and arrest the would-be perpetrator just as if they had committed the crime. We were awed by the “spatial operating environment interface” that John Anderton used when he slipped on the special gloves. Little did we know that only a few years later, multi-touch surfaces and devices like the Xbox Kinect would make those science fiction morsels become a tasty reality long before 2054! I had these when I was a kid. So cool! but the concept of getting trapped inside a virtual video game world was fertile ground for Disney’s second entry in my list. See, kids, back in the 80s, we had to go to a mall to a place called an “arcade” to play video games. And the guy who ran the arcade had the coolest job in the world. There is a bit of cognitive dissonance that still goes on in my head – I refuse to believe that the Jeff Bridges from this movie is the same Jeff Bridges from any of his other movies. Nuh-uh, no way, nohow. You can’t read it without hearing it in the computer voice, can you? 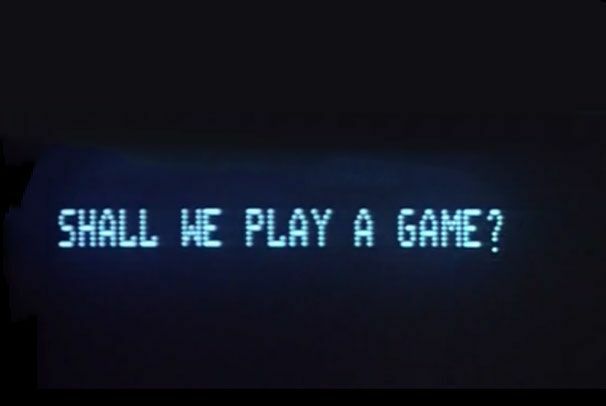 Obviously, I’ve chosen several movies that bridge a gap between implementing technology (“can we do it?”) and philosophy (“should we do it?”), which has long provided a foundational element for plots in movies, literature, etc. What movies did I miss that I should have included? Which one of these movies doesn’t deserve to be in the list? Go ahead, have at it!